Kurkure/cheetos/Nik Naks/corn curls have been a popular American snack food since the 1950s. 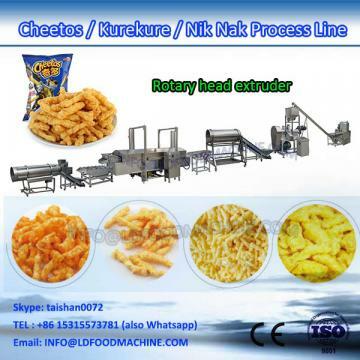 These crispy cheese snacks are formed from corn meal, water, oil, and flavored coatings. 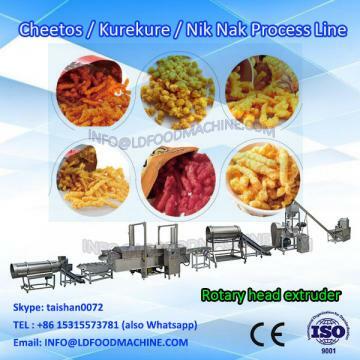 Cheese curls are an extruded snack, meaning they are cooked, pressurized, and pushed out of a die that forms the particular snack shape. They are then baked (or fried, depending on the product) and flavored with oil and seasonings. Today, we eat extruded corn snacks that are ball-shaped,curly, straight, or irregularly shaped depending on the shape of the die. Flavorings added after baking or frying varies greatly and different brands have distinctive flavors. These snacks are extremely popular snacks with children. e. Machines Materials: All the machines are made by stainless steel. 4. Inverters, Conductors and other electronic parts are from World-famous Brands, like FUJI, LG, DELTA. 5. Main Motors are from SIEMENS(CHINA), ensure strong and excellent performance. snack food and bean, peanut etc. It adopt oil circulating, ensure the temperature steady. Automatic filtration system, clean oil sediment anytime, always guarantees oil clean, frying perfect. Startup automatic rising system, convenient to clean and maintain. Large output, low consumption, can saving cost. 1. palm-oil or other nutritious additives are sprayed on the surface of the pellets to improve palatability and conversion rate of feed. 2. Adopting drum pattern and oil atomization spraying system together with continuous and automatic operation. 3. 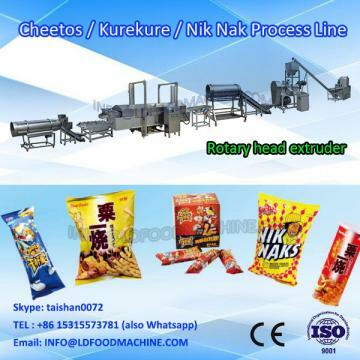 Widely used for spraying fat, vitamin, substrate and medication onto the surface of extrusion feed. A: One year(Calculated from the equipment arrives the customer's side. ).